This article is about the Germanic god. For other uses, see Odin (disambiguation). In Germanic mythology, Odin (from Old Norse Óðinn) is a widely revered god. In Norse mythology, from which stems most of the information about the god, Odin is associated with healing, death, royalty, the gallows, knowledge, battle, sorcery, poetry, frenzy, and the runic alphabet, and is the husband of the goddess Frigg. In wider Germanic mythology and paganism, Odin was known in Old English as Wōden, in Old Saxon as Wōdan, and in Old High German as Wuotan or Wōtan, all stemming from the reconstructed Proto-Germanic theonym wōđanaz. Odin is a prominently mentioned god throughout the recorded history of the Germanic peoples, from the Roman occupation of regions of Germania through the tribal expansions of the Migration Period and the Viking Age. In the modern period, Odin continued to be acknowledged in the rural folklore of Germanic Europe. References to Odin appear in place names throughout regions historically inhabited by the ancient Germanic peoples, and the day of the week Wednesday bears his name in many Germanic languages, including English. In Anglo-Saxon England, Odin held a particular place as a euhemerized ancestral figure among royalty, and he is frequently referred to as a founding figure among various other Germanic peoples, including the Langobards. Forms of his name appear frequently throughout the Germanic record, though narratives regarding Odin are mainly found in Old Norse works recorded in Iceland, primarily around the 13th century. These texts make up the bulk of modern understanding of Norse mythology. In Old Norse texts, Odin is depicted as one-eyed and long-bearded, frequently wielding a spear named Gungnir, and wearing a cloak and a broad hat. 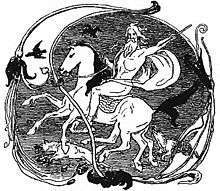 He is often accompanied by his animal companions—the wolves Geri and Freki and the ravens Huginn and Muninn, who bring him information from all over Midgard—and rides the flying, eight-legged steed Sleipnir across the sky and into the underworld. Odin is attested as having many sons, most famously the god Baldr with Frigg, and is known by hundreds of names. In these texts, he frequently seeks greater knowledge, at times in disguise (most famously by obtaining the Mead of Poetry), makes wagers with his wife Frigg over the outcome of exploits, and takes part in both the creation of the world by way of slaying the primordial being Ymir and the gift of life to the first two humans Ask and Embla. Odin has a particular association with Yule, and mankind's knowledge of both the runes and poetry is also attributed to him. In Old Norse texts, Odin is given primacy over female beings associated with the battlefield—the valkyries—and oversees Valhalla, where he receives half of those who die in battle, the einherjar. The other half are chosen by the goddess Freyja for her afterlife location, Fólkvangr. Odin consults the disembodied, herb-embalmed head of the wise being Mímir for advice, and during the foretold events of Ragnarök, Odin is told to lead the einherjar into battle before being consumed by the monstrous wolf Fenrir. In later folklore, Odin appears as a leader of the Wild Hunt, a ghostly procession of the dead through the winter sky. He has also been associated with charms and other forms of magic, particularly in Old English and Old Norse texts. Odin has been a frequent subject of study in Germanic studies, and numerous theories have been developed regarding his characterization. Some of these focus on Odin's particular relation to other figures; for example, the fact that Freyja's husband Óðr appears to be something of an etymological doublet of the god, whereas Odin's wife Frigg is in many ways similar to Freyja, and that Odin has a particular relation to the figure of Loki. Other approaches focus on Odin's place in the historical record, a frequent question being whether the character of Odin is derived from Proto-Indo-European religion, or whether he developed later in Germanic society. In the modern period, Odin has inspired numerous works of poetry, music, and other forms of media. He is venerated in most forms of the new religious movement Heathenry, together with other gods venerated by the ancient Germanic peoples; some branches focus particularly on him. The Old Norse theonym Óðinn (popularly anglicized as Odin) and its cognates, including Old English Wōden, Old Saxon Wōden, and Old High German Wuotan, derive from the reconstructed Proto-Germanic theonym *wōđanaz. The masculine noun *wōđanaz developed from the Proto-Germanic adjective *wōđaz, related to Latin vātēs and Old Irish fáith, both meaning 'seer, prophet'. Adjectives stemming from *wōđaz include Gothic woþs 'possessed', Old Norse óðr, 'mad, frantic, furious', and Old English wōd 'mad'. The adjective *wōđaz (or *wōđō) was further substantivized, leading to Old Norse óðr 'mind, wit, soul, sense', Old English ellen-wōd 'zeal', Middle Dutch woet 'madness', and Old High German wuot 'thrill, violent agitation'. Additionally the Old Norse noun æði 'rage, fury' and Old High German wuotī 'madness' derive from the feminine noun *wōđīn, from *wōđaz. The weak verb *wōđjanan, also derived from *wōđaz, gave rise to Old Norse æða 'to rage', Old English wēdan 'to be mad, furious', Old Saxon wōdian 'to rage', and Old High German wuoten 'to be insane, to rage'. Over 170 names are recorded for the god Odin (see List of names of Odin). These names are variously descriptive of attributes of the god, refer to myths involving him, or refer to religious practices associated with the god. This multitude of names makes Odin the god with the most names known among the Germanic peoples. The weekday name Wednesday derives from Old English wōdnesdæg. Cognate terms are found in other Germanic languages, such as Middle Low German wōdensdach (Dutch Woensdag), and Old Norse Óðinsdagr (Danish, Norwegian and Swedish Onsdag). All of these terms derive from Proto-Germanic *Wodensdag, itself a Germanic interpretation of Latin Dies Mercurii ("Day of Mercury"). However, in Old High German, the name derived from Odin's was replaced by a translation of Church Latin media hebdomas ('middle of the week'), hence modern German Mittwoch. The earliest records of the Germanic peoples were recorded by the Romans, and in these works Odin is frequently referred to—via a process known as interpretatio romana (where characteristics perceived to be similar by Romans result in identification of a non-Roman god as a Roman deity)—as the Roman god Mercury. The first clear example of this occurs in the Roman historian Tacitus's late 1st-century work Germania, where, writing about the religion of the Suebi (a confederation of Germanic peoples), he comments that "among the gods Mercury is the one they principally worship. They regard it as a religious duty to offer to him, on fixed days, human as well as other sacrificial victims. Hercules and Mars they appease by animal offerings of the permitted kind" and adds that a portion of the Suebi also venerate "Isis". In this instance, Tacitus refers to the god Odin as "Mercury", Thor as "Hercules", and Týr as "Mars", and the identity of the "Isis" of the Suebi has been debated. Anthony Birley has noted that Odin's apparent identification with Mercury has little to do with Mercury's classical role of being messenger of the gods, but appears to be due to Mercury's role of psychopomp. 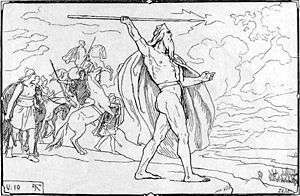 Other contemporary evidence may also have led to the equation of Odin with Mercury; Odin, like Mercury, may have at this time already been pictured with a staff and hat, may have been considered a trader god, and the two may have been seen as parallel in their roles as wandering deities. But their rankings in their respective religious spheres may have been very different. Also, Tacitus' "among the gods Mercury is the one they principally worship" is an exact quote from Julius Caesar's Commentarii de Bello Gallico (1 BCE) in which Caesar is referring to the Gauls and not the Germanic peoples. Regarding the Germanic peoples, Caesar states: "[T]hey consider the gods only the ones that they can see, the Sun, Fire and the Moon", which scholars reject as clearly mistaken, regardless of what may have led to the statement. (and) then struck the adder so that it flew into nine (pieces). that it never would re-enter the house. The emendation of nan to 'man' has been proposed. The next stanza comments on the creation of the herbs chervil and fennel while hanging in heaven by the 'wise lord' (witig drihten) and before sending them down among mankind. Regarding this, Griffith comments that "In a Christian context 'hanging in heaven' would refer to the crucifixion; but (remembering that Woden was mentioned a few lines previously) there is also a parallel, perhaps a better one, with Odin, as his crucifixion was associated with learning." The Old English gnomic poem Maxims I also mentions Odin by name in the (alliterative) phrase Woden worhte weos, 'Woden made idols'), in which he is contrasted with and denounced against the Christian God. The first word of this stanza, ōs (Latin 'mouth') is a homophone for Old English os, a particularly heathen word for 'god'. Due to this and the content of the stanzas, several scholars have posited that this poem is censored, having originally referred to Odin. Kathleen Herbert comments that "Os was cognate with As in Norse, where it meant one of the Æsir, the chief family of gods. In Old English, it could be used as an element in first names: Osric, Oswald, Osmund, etc. but it was not used as a word to refer to the God of Christians. Woden was equated with Mercury, the god of eloquence (among other things). The tales about the Norse god Odin tell how he gave one of his eyes for the price of wisdom; he also won the mead of poetic inspiration. Luckily for Christian rune-masters, the Latin word 'os' could be substituted without ruining the sense, to keep the outward form of the rune name without obviously referring to Woden." In the poem Solomon and Saturn, "Mercurius the Giant" (Mercurius se gygand) is referred to as an inventor of letters. This may also be a reference to Odin, who is in Norse mythology the founder of the runic alphabets, and the gloss a continuation of the practice of equating Odin with Mercury found as early as Tacitus. The poem is additionally in the style of later Old Norse material featuring Odin, such as the Old Norse poem Vafþrúðnismál, featuring Odin and a jötunn engaging in a deadly game of wits. Godan and Frea look down from their window in the heavens to the Winnili women in an illustration by Emil Doepler, 1905. Winnili women with their hair tied as beards look up at Godan and Frea in an illustration by Emil Doepler, 1905. The 7th-century Origo Gentis Langobardorum, and Paul the Deacon's 8th-century Historia Langobardorum derived from it, recount a founding myth of the Langobards, a Germanic people who ruled a region of what is now Italy. According to this legend, a "small people" known as the Winnili were ruled by a woman named Gambara who had two sons, Ybor and Agio. The Vandals, ruled by Ambri and Assi, came to the Winnili with their army and demanded that they pay them tribute or prepare for war. Ybor, Agio, and their mother Gambara rejected their demands for tribute. Ambra and Assi then asked the god Godan for victory over the Winnili, to which Godan responded (in the longer version in the Origo): "Whom I shall first see when at sunrise, to them will I give the victory." Meanwhile, Ybor and Agio called upon Frea, Godan's wife. Frea counseled them that "at sunrise the Winnil[i] should come, and that their women, with their hair let down around the face in the likeness of a beard should also come with their husbands". At sunrise, Frea turned Godan's bed around to face east and woke him. Godan saw the Winnili, including their whiskered women, and asked "who are those Long-beards?" Frea responded to Godan, "As you have given them a name, give them also the victory". Godan did so, "so that they should defend themselves according to his counsel and obtain the victory". Thenceforth the Winnili were known as the Langobards ('long-beards'). Writing in the mid-7th century, Jonas of Bobbio wrote that earlier that century the Irish missionary Columbanus disrupted an offering of beer to Odin (vodano) "(whom others called Mercury)" in Swabia. A few centuries later, 9th-century document from what is now Mainz, Germany, known as the Old Saxon Baptismal Vow records the names of three Old Saxon gods, UUôden ('Woden'), Saxnôte, and Thunaer ('Thor'), whom pagan converts were to renounce as demons. Phol ende uuodan uuoran zi holza. du uuart demo balderes uolon sin uuoz birenkit. lid zi geliden, sose gelimida sin! Phol and Woden travelled to the forest. Then was for Baldur's foal its foot wrenched. limb to limb, so be glued. In the 11th century, chronicler Adam of Bremen recorded in a scholion of his Gesta Hammaburgensis Ecclesiae Pontificum that a statue of Thor, who Adam describes as "mightiest", sat enthroned in the Temple at Uppsala (located in Gamla Uppsala, Sweden) flanked by Wodan (Odin) and "Fricco". Regarding Odin, Adam defines him as "frenzy" (Wodan, id est furor) and says that he "rules war and gives people strength against the enemy" and that the people of the temple depict him as wearing armor, "as our people depict Mars". According to Adam, the people of Uppsala had appointed priests (gothi) to each of the gods, who were to offer up sacrifices (blót), and in times of war sacrifices were made to images of Odin. In the 12th century, centuries after Norway was "officially" Christianized, Odin was still being invoked by the population, as evidenced by a stick bearing a runic message found among the Bryggen inscriptions, Bergen, Norway. On the stick, both Thor and Odin are called upon for help; Thor is asked to "receive" the reader, and Odin to "own" them. Odin is mentioned or appears in most poems of the Poetic Edda, compiled in the 13th century from traditional source material reaching back to the pagan period. blood nor motive powers, nor goodly colour. blood gave Lodur, and goodly colour. Heat gave Lothur and goodly hue. The meaning of these gifts has been a matter of scholarly disagreement and translations therefore vary. Later in the poem, the völva recounts the events of the Æsir-Vanir War, the war between Vanir and the Æsir, two groups of gods. During this, the first war of the world, Odin flung his spear into the opposing forces of the Vanir. The völva tells Odin that she knows where he has hidden his eye; in the spring Mímisbrunnr, and from it "Mímir drinks mead every morning". After Odin gives her necklaces, she continues to recount more information, including a list of valkyries, referred to as nǫnnor Herians 'the ladies of War Lord'; in other words, the ladies of Odin. In foretelling the events of Ragnarök, the völva predicts the death of Odin; Odin will fight the monstrous wolf Fenrir during the great battle at Ragnarök. Odin will be consumed by the wolf, yet Odin's son Víðarr will avenge him by stabbing the wolf in the heart. After the world is burned and renewed, the surviving and returning gods will meet and recall Odin's deeds and "ancient runes". from what root it springs. What root beneath it runs. And forthwith back I fell. While the name of the tree is not provided in the poem and other trees exist in Norse mythology, the tree is near universally accepted as the cosmic tree Yggdrasil, and if the tree is Yggdrasil, then the name Yggdrasil (Old Norse 'Ygg's steed') directly relates to this story. Odin is associated with hanging and gallows; John Lindow comments that "the hanged 'ride' the gallows". In the prose introduction to the poem Sigrdrífumál, the hero Sigurd rides up to Hindarfell and heads south towards "the land of the Franks". On the mountain Sigurd sees a great light, "as if fire were burning, which blazed up to the sky". Sigurd approaches it, and there he sees a skjaldborg with a banner flying overhead. Sigurd enters the skjaldborg, and sees a warrior lying there—asleep and fully armed. Sigurd removes the helmet of the warrior, and sees the face of a woman. The woman's corslet is so tight that it seems to have grown into the woman's body. Sigurd uses his sword Gram to cut the corslet, starting from the neck of the corslet downwards, he continues cutting down her sleeves, and takes the corslet off of her. The woman wakes, sits up, looks at Sigurd, and the two converse in two stanzas of verse. In the second stanza, the woman explains that Odin placed a sleeping spell on her she could not break, and due to that spell she has been asleep a long time. Sigurd asks for her name, and the woman gives Sigurd a horn of mead to help him retain her words in his memory. The woman recites a heathen prayer in two stanzas. A prose narrative explains that the woman is named Sigrdrífa and that she is a valkyrie. A narrative relates that Sigrdrífa explains to Sigurd that there were two kings fighting one another. Odin had promised one of these—Hjalmgunnar—victory in battle, yet she had "brought down" Hjalmgunnar in battle. Odin pricked her with a sleeping-thorn in consequence, told her she would never again "fight victoriously in battle", and condemned her to marriage. In response, Sigrdrífa told Odin she had sworn a great oath that she would never wed a man who knew fear. Sigurd asks Sigrdrífa to share with him her wisdom of all worlds. The poem continues in verse, where Sigrdrífa provides Sigurd with knowledge in inscribing runes, mystic wisdom, and prophecy. Odin is mentioned throughout the books of the Prose Edda, authored by Snorri Sturluson in the 13th century and drawing from earlier traditional material. In the Prose Edda book Gylfaginning (chapter 38), the enthroned figure of High (Harr), tells Gangleri (king Gylfi in disguise) that two ravens named Huginn and Muninn sit on Odin's shoulders. The ravens tell Odin everything they see and hear. Odin sends Huginn and Muninn out at dawn, and the birds fly all over the world before returning at dinner-time. As a result, Odin is kept informed of many events. High adds that it is from this association that Odin is referred to as "raven-god". The above-mentioned stanza from Grímnismál is then quoted. In the same chapter, the enthroned figure of High explains that Odin gives all of the food on his table to his wolves Geri and Freki and that Odin requires no food, for wine is to him both meat and drink. Óðinn throws his spear at the Vanir host in an illustration by Lorenz Frølich (1895). Odin is mentioned several times in the sagas that make up Heimskringla. In Ynglinga saga, the first section of Heimskringla, an euhemerized account of the origin of the gods is provided. Odin is introduced in chapter two, where he is said to have lived in "the land or home of the Æsir" (Old Norse Ásaland eða Ásaheimr), the capital of which being Ásgarðr. Ásgarðr was ruled by Odin, a great chieftain, and was "a great place for sacrifices". It was the custom there that twelve temple priests were ranked highest; they administered sacrifices and held judgements over men. "Called diar or chiefs", the people were obliged to serve under them and respect them. Odin was a very successful warrior and traveled widely, conquering many lands. Odin was so successful that he never lost a battle. As a result, according to the saga, men came to believe that "it was granted to him" to win all battles. Before Odin sent his men to war or to perform tasks for him, he would place his hands upon their heads and give them a bjannak ('blessing', ultimately from Latin benedictio) and the men would believe that they would also prevail. The men placed all of their faith in Odin, and wherever they called his name they would receive assistance from doing so. Odin was often gone for great spans of time. Chapter 3 says that Odin had two brothers, Vé and Vili. While Odin was gone, his brothers governed his realm. Once, Odin was gone for so long that the Æsir believed that Odin would not return. His brothers began to divvy up Odin's inheritance, "but his wife Frigg they shared between them. However, afterwards, [Odin] returned and took possession of his wife again". Chapter 4 describes the Æsir-Vanir War. According to the chapter, Odin "made war on the Vanir". However, the Vanir defended their land and the battle turned to a stalemate, both sides having devastated one another's lands. As part of a peace agreement, the two sides exchanged hostages. One of the exchanges went awry and resulted in the Vanir decapitating one of the hostages sent to them by the Æsir, Mímir. The Vanir sent Mímir's head to the Æsir, whereupon Odin "took it and embalmed it with herbs so that it would not rot, and spoke charms [Old Norse galdr] over it", which imbued the head with the ability to answer Odin and "tell him many occult things". In Völsunga saga, the great king Rerir and his wife (unnamed) are unable to conceive a child; "that lack displeased them both, and they fervently implored the gods that they might have a child. 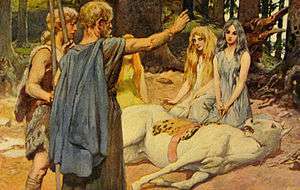 It is said that Frigg heard their prayers and told Odin what they asked", and the two gods subsequently send a valkyrie to present Rerir an apple that falls on to his lap while he sits on a burial mound and Rerir's wife subsequently becomes pregnant with the namesake of the Völsung family line. that on ten feet run? that is Odin riding on Sleipnir." Local folklore and folk practice recognized Odin as late as the 19th century in Scandinavia. In a work published in the mid-19th century, Benjamin Thorpe records that on the island of Gotland, Sweden, "many traditions and stories of Odin the Old still live in the mouths of the people". Thorpe notes that in Blekinge, Sweden, "it was formerly the custom to leave a sheaf on the field for Odin's horses", and cites other examples, such as in Kråktorpsgård, Småland, where a barrow was purported to have been opened in the 18th century, purportedly containing the body of Odin. After Christianization, the mound was known as Helvetesbackke (Swedish "Hell's Mound"). Local legend dictates that after it was opened, "there burst forth a wondrous fire, like a flash of lightning", and that a coffin full of flint and a lamp were excavated. Thorpe additionally relates that legend has it that a priest who dwelt around Troienborg had once sowed some rye, and that when the rye sprang up, so came Odin riding from the hills each evening. Odin was so massive that he towered over the farm-yard buildings, spear in hand. Halting before the entry way, he kept all from entering or leaving all night, which occurred every night until the rye was cut. Thorpe relates that "a story is also current of a golden ship, which is said to be sunk in Runemad, near the Nyckelberg, in which, according to tradition, Odin fetched the slain from the battle of Bråvalla to Valhall", and that Kettilsås, according to legend, derives its name from "one Ketill Runske, who stole Odin's runic staves" (runekaflar) and then bound Odin's dogs, bull, and a mermaid who came to help Odin. Thorpe notes that numerous other traditions existed in Sweden at the time of his writing. Thorpe records (1851) that in Sweden, "when a noise, like that of carriages and horses, is heard by night, the people say: 'Odin is passing by'". Odin and the gods Loki and Hœnir help a farmer and a boy escape the wrath of a bet-winning jötunn in Loka Táttur or Lokka Táttur, a Faroese ballad dating to the late Middle Ages. References to or depictions of Odin appear on numerous objects. Migration Period (5th and 6th century CE) gold bracteates (types A, B, and C) feature a depiction of a human figure above a horse, holding a spear and flanked by one or more often two birds. The presence of the birds has led to the iconographic identification of the human figure as the god Odin, flanked by Huginn and Muninn. Like Snorri's Prose Edda description of the ravens, a bird is sometimes depicted at the ear of the human, or at the ear of the horse. Bracteates have been found in Denmark, Sweden, Norway and, in smaller numbers, England and areas south of Denmark. Austrian Germanist Rudolf Simek states that these bracteates may depict Odin and his ravens healing a horse and may indicate that the birds were originally not simply his battlefield companions but also "Odin's helpers in his veterinary function." Vendel era helmet plates (from the 6th or 7th century) found in grave in Sweden depict a helmeted figure holding a spear and a shield while riding a horse, flanked by two birds. The plate has been interpreted as Odin accompanied by two birds; his ravens. Two of the 8th century picture stones from the island of Gotland, Sweden depict eight-legged horses, which are thought by most scholars to depict Sleipnir: the Tjängvide image stone and the Ardre VIII image stone. Both stones feature a rider sitting atop an eight-legged horse, which some scholars view as Odin. Above the rider on the Tjängvide image stone is a horizontal figure holding a spear, which may be a valkyrie, and a female figure greets the rider with a cup. The scene has been interpreted as a rider arriving at the world of the dead. The mid-7th century Eggja stone bearing the Odinic name haras (Old Norse 'army god') may be interpreted as depicting Sleipnir. A pair of identical Germanic Iron Age bird-shaped brooches from Bejsebakke in northern Denmark may be depictions of Huginn and Muninn. The back of each bird feature a mask-motif, and the feet of the birds are shaped like the heads of animals. The feathers of the birds are also composed of animal-heads. Together, the animal-heads on the feathers form a mask on the back of the bird. The birds have powerful beaks and fan shaped tails, indicating that they are ravens. The brooches were intended to be worn on each shoulder, after Germanic Iron Age fashion. Archaeologist Peter Vang Petersen comments that while the symbolism of the brooches is open to debate, the shape of the beaks and tail feathers confirms the brooch depictions are ravens. Petersen notes that "raven-shaped ornaments worn as a pair, after the fashion of the day, one on each shoulder, makes one's thoughts turn towards Odin's ravens and the cult of Odin in the Germanic Iron Age." Petersen says that Odin is associated with disguise and that the masks on the ravens may be portraits of Odin. The Oseberg tapestry fragments, discovered within the Viking Age Oseberg ship burial in Norway, features a scene containing two black birds hovering over a horse, possibly originally leading a wagon (as a part of a procession of horse-led wagons on the tapestry). In her examination of the tapestry, scholar Anne Stine Ingstad interprets these birds as Huginn and Muninn flying over a covered cart containing an image of Odin, drawing comparison to the images of Nerthus attested by Tacitus in 1 CE. Excavations in Ribe, Denmark have recovered a Viking Age lead metal-caster's mold and 11 identical casting-moulds. These objects depict a mustached man wearing a helmet that features two head-ornaments. Archaeologist Stig Jensen proposes these head-ornaments should be interpreted as Huginn and Muninn, and the wearer as Odin. He notes that "similar depictions occur everywhere the Vikings went—from eastern England to Russia and naturally also in the rest of Scandinavia." A portion of Thorwald's Cross (a partly surviving runestone erected at Kirk Andreas on the Isle of Man) depicts a bearded human holding a spear downward at a wolf, his right foot in its mouth, and a large bird on his shoulder. Andy Orchard comments that this bird may be either Huginn or Muninn. Rundata dates the cross to 940, while Pluskowski dates it to the 11th century. This depiction has been interpreted as Odin, with a raven or eagle at his shoulder, being consumed by the monstrous wolf Fenrir during the events of Ragnarök. In November 2009, the Roskilde Museum announced the discovery and subsequent display of a niello-inlaid silver figurine found in Lejre, Denmark, which they dubbed Odin from Lejre. The silver object depicts a person sitting on a throne. The throne features the heads of animals and is flanked by two birds. The Roskilde Museum identifies the figure as Odin sitting on his throne Hliðskjálf, flanked by the ravens Huginn and Muninn. 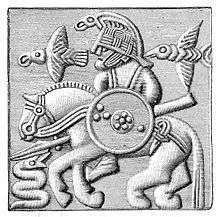 For instance, beside the figure of Odin on his horse shown on several memorial stones there is a kind of knot depicted, called the valknut, related to the triskele. This is thought to symbolize the power of the god to bind and unbind, mentioned in the poems and elsewhere. Odin had the power to lay bonds upon the mind, so that men became helpless in battle, and he could also loosen the tensions of fear and strain by his gifts of battle-madness, intoxication, and inspiration. Davidson says that similar symbols are found beside figures of wolves and ravens on "certain cremation urns" from Anglo-Saxon cemeteries in East Anglia. According to Davidson, Odin's connection to cremation is known, and it does not seem unreasonable to connect with Odin in Anglo-Saxon England. Additionally, Davidson proposes further connections between Odin's role as bringer of ecstasy by way of the etymology of the god's name. Beginning with Henry Petersen's doctoral dissertation in 1876, which proposed that Thor was the indigenous god of Scandinavian farmers and Odin a later god proper to chieftains and poets, many scholars of Norse mythology in the past viewed Odin as having been imported from elsewhere. The idea was developed by Bernhard Salin on the basis of motifs in the petroglyphs and bracteates and with reference to the Prologue of the Prose Edda, which presents the Æsir as having migrated into Scandinavia; he proposed that both Odin and the runes were introduced from southeastern Europe in the Iron Age. Other scholars placed his introduction at different times; Axel Olrik, during the Migration Age as a result of Gaulish influence. More radically, both the archeologist and comparative mythologist Marija Gimbutas and the Germanicist Karl Helm argued that the Æsir as a group, which includes both Thor and Odin, were late introductions into northern Europe and that the indigenous religion of the region had been Vanic. Although the view of Odin as in some way a latecomer dominated until the mid-20th century, it was then superseded by the trifunctional hypothesis of Georges Dumézil, under which Odin is assigned one of the core functions in the Indo-European pantheon, as a representative of the first function (sovereignty) corresponding to the Hindu Varuṇa (fury and magic) as opposed to Týr, who corresponds to the Hindu Mitrá (law and justice); while the Vanir represent the third function (fertility). As a result, the early debate over his origins has rarely been revisited. Another approach to Odin has been in terms of his function and attributes. Many early scholars interpreted him as a wind-god or especially as a death-god. He has also been interpreted in the light of his association with ecstatic practices, and Jan de Vries compared him to the Hindu god Rudra and the Greek Hermes. The god Odin has been a source of inspiration for a variety of modern artists working in fine art, literature, and music. Fine art depictions of Odin in the modern period include the pen and ink drawing Odin byggande Sigtuna (1812) and the sketch King Gylfe receives Oden on his arrival to Sweden (1816) by P. Hörberg; the drinking horn relief Odens möte med Gylfe (1818), the marble statue Odin (1830) and the colossal bust Odin by B. E. Fogelberg, the statues Odin (1812/1822) and Odin (1824/1825) by H. E. Freund, the sgraffito over the entrance of Villa Wahnfried in Bayreuth (1874) by R. Krausse, the painting Odin (around 1880) by E. Burne-Jones, the drawing Thor und Magni (1883) by K. Ehrenberg, the marble statue Wodan (around 1887) by H. Natter, the oil painting Odin und Brunhilde (1890) by Konrad Dielitz, the graphic drawing Odin als Kriegsgott (1896) by H. Thoma, the painting Odin and Fenris (around 1900) by Dorothy Hardy, the oil painting Wotan und Brünhilde (1914) by K. Moser, the painting The Road to Walhall by S. Nilsson, the wooden Oslo City Hall relief Odin og Mime (1938) and the colored wooden relief in the courtyard of the Oslo City Hall Odin på Sleipnir (1945-1950) by D. Werenskiold, and the bronze relief on the doors of the Swedish Museum of National Antiquities, Odin (1950) by Bror Marklund. Works of modern literature featuring Odin include the poem Der Wein (1745) by F. v. Hagedom, Hymne de Wodan (1769) by F. G. Klopstock, Om Odin (1771) by P. F. Suhm, the tragedy Odin eller Asarnes invandring by K. G. Leopold, the epic poem Odin eller Danrigets Stiftelse (1803) by J. Baggeson, the poem Maskeradenball (1803) and Optrin af Norners og Asers Kamp: Odin komme til Norden (1809) by N. F. S. Grundtvig, poems in Nordens Guder (1819) by Adam Oehlenschläger, the four-part novel Sviavigamal (1833) by C. J. L. Almqvist, the poem Prelude (1850) by W. Wordsworth, the canzone Germanenzug (1864) by R. Hamerling,the poem Zum 25. August 1870 (1870) by Richard Wagner, the ballad Rolf Krake (1910) by F. Schanz, the novel Juvikingerne (1918-1923) by O. Duun, the comedy Der entfesselte Wotan (1923) by E. Toller, the novel Wotan by K. H. Strobl, Herrn Wodes Ausfahrt (1937) by H. F. Blunck, the poem An das Ich (1938) by H. Burte, and the novel Sage vom Reich (1941–1942) by H. F. Blunck. Several characters from J. R. R. Tolkien's fiction were inspired by the god Odin. The appearance of the wizard Gandalf was particularly inspired by Odin's "wanderer" guise, whereas other aspects of the god directly influenced other characters such as Saruman, Sauron, Morgoth, and Manwë. Neil Gaiman's novel American Gods features Odin as Mr. Wednesday, a man who employs the main character Shadow as they travel the U.S. embroiled in a clash of old gods vs. new. The novel is being adapted for television by Brian Fuller and Michael Green, with an air-date set for 2017. Ian Mcshane will play Mr. Wednesday. Music inspired by or featuring the god includes the ballets Odins Schwert (1818) and Orfa (1852) by J. H. Stunz and the opera cycle Der Ring des Nibelungen (1848–1874) by Richard Wagner. Woden appears in the comic The Wicked + The Divine, in current times as a young male with perverted desires, and in the 1830s as Mary Shelley. 1 2 3 Birley (1999:42 and 106—107). 1 2 3 Griffiths (2006 :183). ↑ For example, Herbert (2007 :33), Pollington (2008 :18). 1 2 Griffiths (2006 :174). 1 2 Hollander (1964), p. 7. ↑ Hollander (1964), p. 7-8. ↑ Byock (1990), p. 36. ↑ Simek (2007:43 and 164). ↑ Simek (2007:164) and Lindow (2005:187). 1 2 3 Pluskowski (2004:158). ↑ Roskilde Museum. Odin fra Lejre and additional information. Retrieved Nov 16, 2009. 1 2 Davidson 1990, p. 147. ↑ Vries 1970b, p. 89—90. ↑ Polomé 1970, p. 60. ↑ Gimbutas & Robbins Dexter 1999, p. 191. ↑ Turville-Petre 1964, p. 103. ↑ Polomé 1970, p. 58—59. ↑ Vries 1970b, p. 93. ↑ Vries 1970b, p. 94—97. ↑ "Ian McShane cast in Neil Gaiman TV adaptation American Gods". Munro, Dana Carleton (Trans.) (1895). Life of St. Columban. The Department of History of the University of Pennsylvania. Wikimedia Commons has media related to Odin.